2015 has been a VERY fruitful one. On top of accepting a new role at work and running off to Portugal to elope with the love of my life - 6 days after we returned from our trip, we MOVED! So let's talk about how much of a stress case I was. Note to self - Don't do 3 major things all in a span of 1 month, ha! The timing was horrible BUT we had been looking to move from our area for many years and this townhome was brand new and located in the best area. We really couldn't say no. So, after about 2 weeks of fighting, bickering, purging, organizing, buying and selling - We finally have our place decent enough to live comfortably. Most importantly, we are extremely happy in our new neighbourhood. We also decided it would be a good time to change the pallet of our home. We've had the same look for about the last 4- 6 years and we decided to move towards a much lighter and brighter pallet. We also had a goal - We wanted to live a more minimal life which meant trimming down on everything. In today's blog, I wanted to share just a few details I love about the new home. First things first, we upped our game and up graded to a king bed and we found ours at Moe's Furniture. Wow - Not sure if I can ever go back to smaller, it's an absolute luxury. Best part, it's a storage bed. 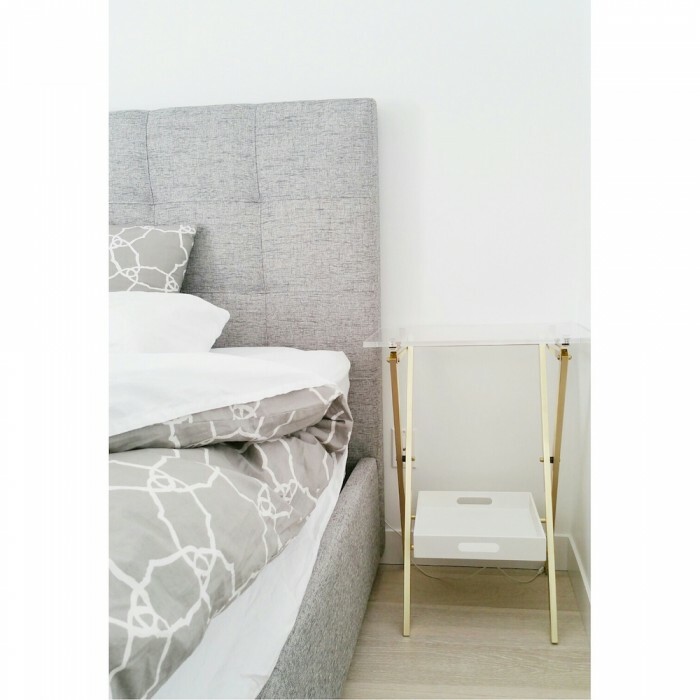 The bed has a pin tuck head board and wrapped in a gorgeous grey textured linen like fabric. We had something in mind for our side tables and had a hard time finding the right thing. We actually ended up using dining room side tables and added a white lacquered tray to the bottom to give it some storage ability, both rom CB2. Since the foot print of the side table is fairly small we decided against table lamps and went with these funky gold swing lights from CB2. not only do they provide a stylish look, they are completely functional and they are space savers. Right off the bedroom, we have our own private balcony. This is the ultimate "quite zone" and guess who has been enjoying it more than we have? It's the perfect little nook to enjoy a cup of java and to take in some fresh air. The separation is probably the best thing. I think sometimes splitting square footage between 2 floors can make a space look smaller, but this is why we decided to go for a lighter pallet. It opens up the space a bit more. We're also very fortunate we have a lot of windows and skylights. Although, our dog Rocco doesn't seem to be a fan of the stairs yet. We are still looking for a smaller dining table, but we did find a ceiling light solution. I knew I wanted something geometric and my husband found a work around. He found the ceiling light rope, bulb and the gold decor piece separately at CB2. Lucky for us, the light tube fits perfectly through the gold decor piece! Viola - DIY geometric lamp shade ceiling light. Aside from the private balcony, we love our front porch. It faces into the court yard where all the neighbours and the kids hang out. I found some great planters from Crate and Barrel and headed straight to Art Knapps for some outdoor plants. I didn't want anything to floral, but I needed a deep splash of color. I went for the purple shammrock plant and coleus. These guys have lasted me straight into the fall season. WOW - What a work in progress. We've made a lot of headway, with so many other details in the works. Hopefully we'll be able to get some art work up on the walls soon!